It's said: "Fish and bread keep a poor man fed". However, this proverb can't be applied to Aries in February. Horoscope for the 2nd month of 2018 advises that Aries will not belong to the modest ones who would be happy only with the basic. The 10 gigabyte data on your mobile phone will evaporate faster than a lemonade may disappear in hot summer. Similarly, when you will look at the sum of your spending on food, clothing and entertainment, it will give you the shivers. Aries, do not worry. The February horoscope only recommends – curb a bit your sense of cultivated taste accompanied by great generosity. Taurus, in February you will tend to solve problems scientifically. Definitely, you will bet on some "wise" book, a bestseller, rather than on telepathy or intuition. But if Taurus is troubled by unhappy love, or if you have problems in relationships with colleagues or superiors, even the best advices found in books or on internet may not work well. During February, you will find out if you have really good friends. Taurus, the 2018 horoscope tells that close friends, but no one else, will help you overcome the difficulties and will give you best advice on how to prosper. It's time for your hobby! February is the right moment for creativity, also for rest, and for building lasting relationships. The horoscope encourages Gemini – If you like design, take a pencil and try to design a brand new chair. A skilful joiner can certainly turn your draft into a real piece of art. And such an unique piece of furniture can also serve as a gift for the one you love. But, if you love animals, adopt a giraffe and support the local ZOO. Finally, February 2018 offers an ideal opportunity to test manual skills as well. Gemini, you can knit up a scarf, make a bird feeder or try to prepare a real handmade three-tier cake for your friends. It seems that you should concentrate on education. However, the February horoscope of 2018 shows Leo's tasks in slightly different light. Leo's mind will constantly hover in clouds, in the land of dreams and fantasy. Leo may simply fall in love. Who would in such case be interested in Excel charts? Who would be interested in the Latin name of the thigh muscle? Who would be interested in all the works of Ernest Hemingway when the most amazing "babe" is near you? A loud shot from a cannon, let alone an alarm clock, is useless in such case. Libra is known for loving the order. But of course, "too many cooks spoil the broth" is the saying. If you have to arrange a children's train trip, a corporate party, and a new golf club website that has offered you membership, Libra will get an serious headache. So, we are afraid that in February, people born under Libra will reach the limits of their managerial skills. It is enough when you are in the hurry and you just scratch one important piece of information on the "post-it" paper, and everything may soon go wrong. This yellow paper may accidentally disappear from the fridge, or from the bulletin board, or from the door. Therefore the horoscope warns Libra, stay careful and do not be afraid to say "NO" if you do not already have the situation under control. February 2018 will stimulate Scorpio's ability to solve very complex tasks. What is also characteristic is the fact that if you decide to buy a new dress or a tie, it will definitely be some unique piece with complicated ornament or pattern. Scorpio, it is very likely that after the demanding performance of your gray cerebral cortex, you will also appreciate your comfortable bed as well as the loving partner's arms. In this regard, you will be definitely lucky. 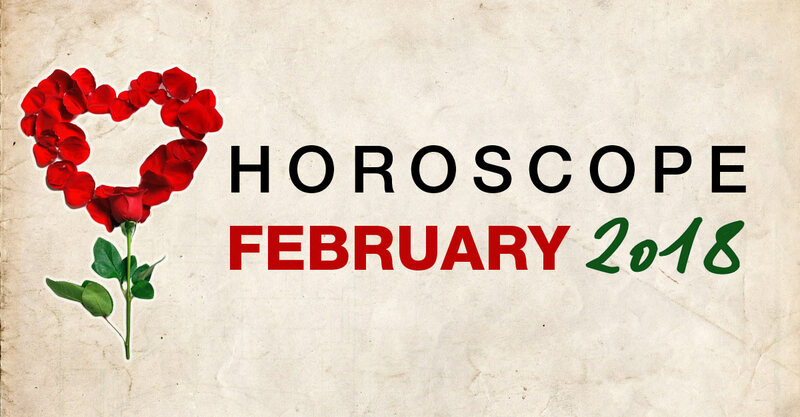 Although relationships may be tempestuous in February, Scorpio simply need to feel the pure intensity in love. Sagittarius, do you know the movie Everything is lost with the famous actor Robert Redford? If not, it might be worth to see it now. February 2018 can bring you a similar worry. Sagittarius, you can feel lonely on your voyage, even though you might have imagined that loneliness would be the source of the desired relaxation. The horoscope highlights that the boundary between perfect relaxation and desperate solitude is quite thin. Do not forget to think about "saving for a rainy day ". Keep all the little but important things in mind during whole February (from one spare battery pack for your mobile phone to one extra pack of sugar in the pantry). And do not worry, everything will go well, in your life as well as in the movie. Pisces, you will perceive the beginning of the 2018 as moving at snail's pace. But do not be fooled. Things look different at first glance and in comparison with closer examination. A snail can unexpectedly become a tiger that throws away its shell and leaps forward generically. February will therefore be the month when Pisces may overcome prolonged health problems that are also related to slow pace of work. In some cases, process of healing may be miraculous and strong as the story of Harry Potter. According to the horoscope, you may also enjoy interesting encounters and meet new people. Pisces, you'll actually enjoy February, although it may not look like it now!